Previously, individual players or guilds would have to pay silver in order to maintain their ownership of a territory or housing plot. The upkeep was withdrawn automatically from the player’s or guild’s in-game account. If a player did not have enough silver in their account to cover the upkeep when it was withdrawn, they would lose the rights to their plot. Food will now serve this purpose instead of silver, with both guild territories and individual buildings such as crafting stations now requiring food to maintain functional. Claiming a plot or territory will still require silver as an initial purchase, but once a territory is claimed it will rely on food. Food will also be required to ensure crafting buildings remain fully operational. Crafting buildings are available to players to build on their plots or territories, and then take raw materials to the building’s NPC to be refined, or crafted into a weapon or piece of armor, for example. Buildings have a durability meter which needs to be maintained by repairing the building every so often, and that will still be the case. However, buildings will now have an additional meter for food. The food meter on a building will, like the meter for territories, constantly deplete, though while a building has enough food, its durability meter will not deplete day-to-day. Durability will only take a hit if the building’s food stock is depleted fully, or when the building is attacked by a player. This means it is possible to maintain the building’s durability and prevent decay for extended periods of time as long as the building is given enough food. Now, territories require upkeep in the form of food. They will continuously require food, and when their food supply is exhausted, they will become inactive and their previously owning guild will cease to have ownership over that territory, leaving the territory open to other guilds. Players can “feed” their territories by interacting with the monolith, a large stone in the centre of the territory, and depositing food from their inventory into the monolith’s storage. There is a “nutrition bar” in the menu which acts as an indicator of how much food will need to be deposited to keep the monolith active. Guilds will receive a warning message if a territory of theirs is running low on food. 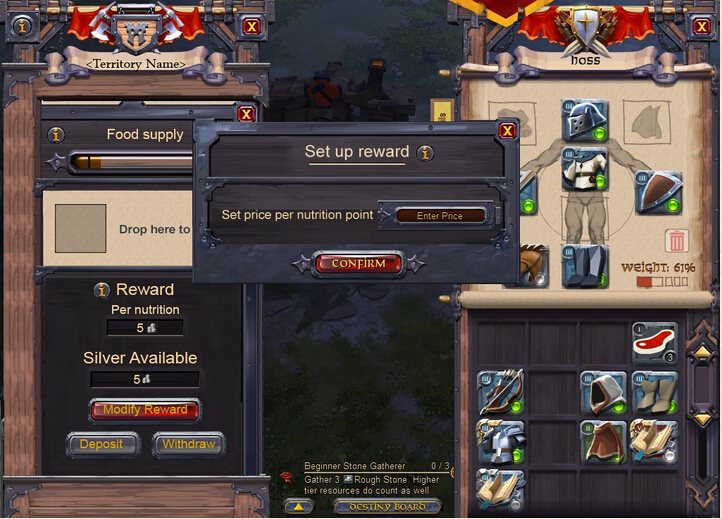 To further incentivize supplying a territory with food, territory owners can choose to set a reward, in the form of silver, for players who deposit food. The guild can create and contribute to a communal reward pool, and a Guild Leader, Right Hand or Master of Coin can set an amount to be rewarded to players depositing food. When a territory is claimed, the food level rolls over for the claiming guild, with a bonus awarded to the conquering guild. The new guild will then continue feeding the territory as previously.